So maybe I have said this before but the playground we visited this morning is my new favorite! 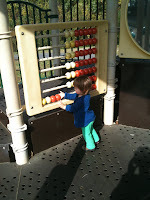 At the recommendation of our friends at B Chase we checked out The Kinder Farm Park and Playground. Once a farm owned by the Kinder Family, Anne Arundel County bought the property in the late 70's and it is now run by a group of community volunteers and friends. While this playground technically breaks one of my Playground Tour rules, it is not free, there is a $6 dollar charge to enter the park, it is well worth the money. The Playground itself is a very large 3 tiered playground, with climbers, slides, bridges, and everything else you could possibly want at a playground. The first two tiers are connected by two large slides with a climbing wall so kids can walk right back up to the top. We spent a good portion of our time at these slides. The bottom tier, also connected with a slide has swings. 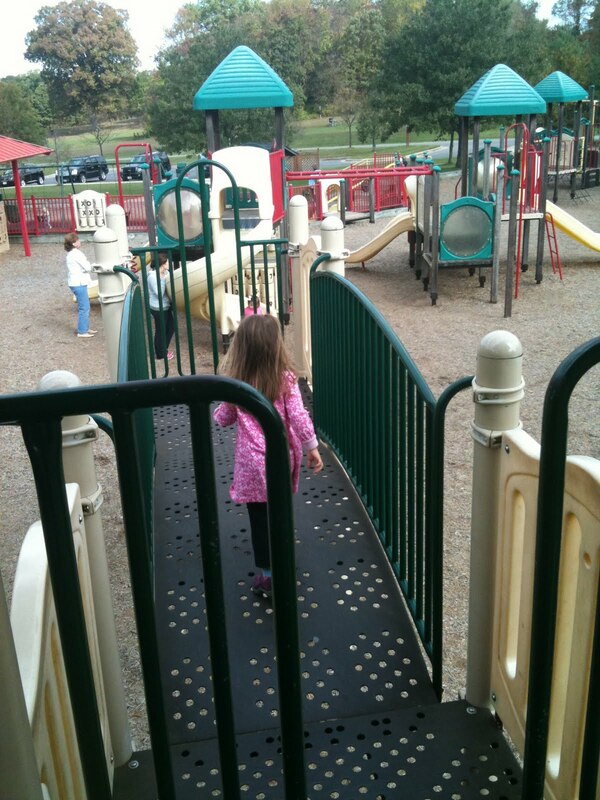 As if this large playground wasn't enough, just behind the playground is a path that takes you back to the farm area. Where there are many original barns with cows, goats, chickens, pigs, sheep, ducks, and roosters. 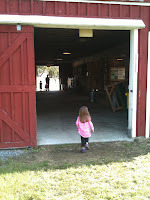 The girls loved checking out all the animals and all the old tractors they have on display. The park also has pavilions for parties, picnic tables, a youth group camping area, a community garden and sports field. We will most definitely be returning! 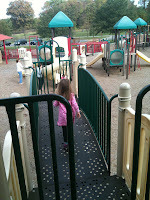 I stumbled across this blog and love your playground tour! I will be trying out some new playgrounds soon. Just FYI, at Kinder Farm you can park at the recreational fields (a left turn just before the pay booth), and walk over through the farm area for free! Thanks Kim! I am so glad you found it! 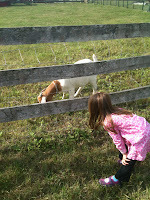 And thanks for the great tip about Kinder Farm, we will definitely check that out next time!